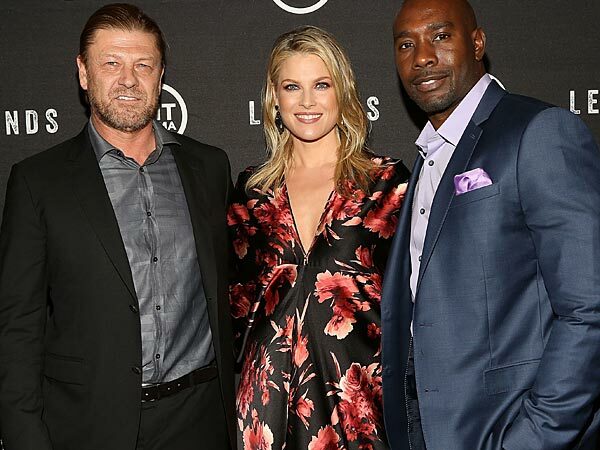 THERE'S a small moment in the premiere of TNT's "Legends" in which undercover FBI agent Martin Odum is introduced to a new colleague, who tells him they have something in common. "I'm an Air Force brat, too," says the young analyst ( Tina Majorino, "Veronica Mars"). "Only my father was never stationed overseas, so I didn't get a cool accent out of the deal." And just like that, Martin is free to spend at least part of every episode sounding like the man playing him, Yorkshire-born Sean Bean ("Game of Thrones," "Lord of the Rings") rather than someone from Anytown, USA. It may not be graceful exposition, but it's a smart move, giving Bean a home base for a character who, in the course of his work, employs a variety of accents, and challenging the assumption that only viewers of PBS - and CBS' "Late Late Show," where Scottish-accented Craig Ferguson may be replaced by English comedian James Corden - can decipher British dialects. It's an assumption that ignores the number of successful Brits on "reality" TV (though some believe a thick accent helped get judge Cheryl Cole dumped from the U.S. version of "X Factor" a few seasons ago). "I think people accept it," said "Legends" executive producer David Wilcox last month of the explanation for Bean's accent. "We don't belabor it." Based on a novel by Robert Littell and developed for television by Howard Gordon ("24," "Homeland"), "Legends" - the title refers to a term for the elaborate backstories of undercover agents - may be playing a longer game, Wilcox hinted, raising issues about Odum's true identity for which "his accent may be a clue." Martin's supervisor (played by Cherry Hill's Ali Larter) is certainly suspicious, complaining in next week's episode that she doesn't know "if that accent's even real." There are practical advantages to giving Bean one fewer voice to manage. "Sean really prides himself on doing an enormous amount of research and preparation, and obviously we try to accommodate that when we're coming up with these legends [for Odum]," Wilcox said. "So we really tried to take his accent, his persona, and play to his strengths." Bean, who works with a voice coach, said that he'll be playing a Texan in a future episode, something that "was easier to learn than a 'regular' American accent. . . . It's very idiosyncratic." That may explain why Irish actress Eve Hewson - the daughter of U2's Bono - is playing a nurse from West Virginia, and not someone from, say, Ohio, in Cinemax's new drama "The Knick" (9 p.m. Fridays). More commonly, British and Australian actors have been hiding in plain sight for years, as casting agents look for experienced people with less familiar faces. And sometimes they're asked to do much more than blend in. In FX's "The Americans," Matthew Rhys ("Brothers and Sisters") is a Welshman playing a Russian who's pretending to be an American. In the same network's new drama "Tyrant," Briton Adam Rayner plays an Americanized Arab who grew up in the Middle East and has returned after a long absence. There may be fans of FX's hit motorcycle drama "Sons of Anarchy" who wouldn't recognize the true accent of Newcastle-born Charlie Hunnam, who plays "Jax" Teller, and "Homeland" viewers who never dreamed that Damian Lewis, who was Sgt. Nicholas Brody, is the veddy British grandson of a former lord mayor of London. It's hard to imagine Jax or Brody sounding anything but American, but made-in-the-USA voices may no longer be a must. ABC Family's "Switched at Birth," already breaking ground with extensive use of American Sign Language, recently added a character played by British actress Rachel Shenton, whose supposedly American character attributes her accent to her time at boarding school. FX's acerbic romantic comedy "You're the Worst" (10:30 p.m. Thursdays) features Cambridge-born Chris Geere as an obnoxious English writer living in Los Angeles who falls into a relationship with a publicist (Aya Cash) who's pretty blunt herself. "The part originally was for an American, and I was apparently the only person that auditioned with a British voice," Geere said. "I think we Americans have a false sense that British actors are all really good at doing an American accent, because it's not true. They're mostly just awful at it," said "You're the Worst" creator Stephen Falk, who may have been channeling one of his own characters at the time. "I think there have been a few successful examples, but even like Hugh Laurie, in 'House,' I hear some British people saying, 'No, it's terrible,' " Falk added. Geere's character's name - Jimmy Shive-Overly - sounds like a British caricature, but Falk insisted it was the name all along. "I just thought it was sort of pretentious and writerly," he said. "It just happens to sound super British, and when Chris auditioned on tape, I had gone through a lot of rounds of auditions and auditioned a lot of dudes, a lot of Americans, and instantly, when I heard him audition, I knew he was the guy. Then I also had a twin realization that I had written a British character. I just didn't know it. . . . He can get away with saying a lot worse stuff because of the accent. We're charmed by it." Some accents are more appealing than others, of course, but two Scottish "Doctor Who" veterans who've charmed viewers on both sides of the Atlantic, David Tennant and Karen Gillan, will be on U.S. network series this fall, sounding very different. Tennant, who's reprising his role in BBC America's murder mystery "Broadchurch" for Fox's "Gracepoint," starting Oct. 2, said that adopting an American accent helped him differentiate the very similar projects. "Having a different voice makes you a different person," Tennant said. "It makes you think in a different way." Gillan, who shed her accent and shaved her head to play Nebula in "Guardians of the Galaxy," will play a modern-day Eliza-not-quite-Doolittle opposite John Cho ("Sleepy Hollow") in ABC's new "Pygmalion"-themed rom-com "Selfie," starting Sept. 30. When a reporter asked why Eliza couldn't keep Gillan's accent, "Selfie" creator Emily Kapnek joked that she didn't "find Karen's accent that convincing. People are charmed by it, but I feel like she's in and out of it a lot. It's patchy." For Gillan, some of the fun lay in finding a voice for her social-media-obsessed character: "I watched a lot of American TV shows for this research. Went to [spinning studio] SoulCycle to listen to the women. It's a combination of all the girls who go to SoulCycle."